The National Bureau of Economic Research has released the study summarized below. In today's tough job market for grad students, it suggests inherent optimists do better - at least for MBAs. Happy Labor Day. 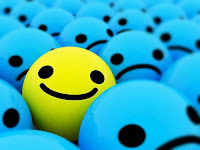 Dispositional optimism is a personality trait associated with individuals who believe, either rightly or wrongly, that in general good things tend to happen to them more often than bad things. Using a novel longitudinal data set that tracks the job search performance of MBA students, we show that dispositional optimists experience significantly better job search outcomes than pessimists with similar skills. During the job search process, they spend less effort searching and are offered jobs more quickly. They are choosier and are more likely to be promoted than others. Although we find optimists are more charismatic and are perceived by others to be more likely to succeed, these factors alone do not explain away the findings. Most of the effect of optimism on economic outcomes stems from the part that is not readily observed by one's peers.